See that bloke on the right pumping the air? 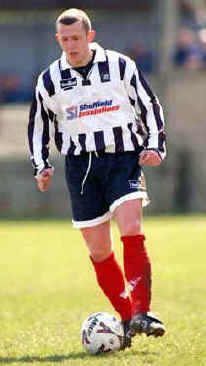 that's John Hendry of Scots junior side Pollok after having netted against Cumbernauld. If you're ever in Glasgow and unable to get into an old firm home game, you may wish to forsake the dubious pleasures of lower league sides such as Partick and head instead to the Shawlands area of the city. There you'll find the distinctive surroundings of Newlandsfield Park, home of Pollok. Although they play in what is known as junior football, it's got nowt to do with bairns and instead is the Scottish equivalent of our non-league game. On a good day, home crowds can approach 1,000 - a figure many Scottish league sides would kill for. 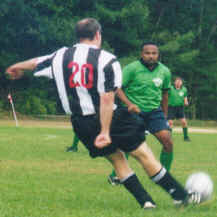 Sunday League action from the Boston suburb of Sudbury, Massachusetts, where the black and white is being proudly worn by an expats side in the New England over the Hill Soccer League. Unfortunately like Newcastle, Sudbury got to within touching distance of glory, only to fail at the last hurdle when they went down 3-1 to Grotton-Dunstable and thus missed out on the silverware. Thanks to the Sudbury goalkeeper Mark Spector for the suggestion and for the photos, taken by his son Philip - good shout. In tribute to the record-book rewriting that they indulged in earlier this week, we immortalise Forest Green Rovers this time out, from the rural depths of Gloucestershire. Having achieved a brave 2-2 draw at Macclesfield in the 1st round of the FA Cup, it was replay time on Wednesday for the Conference side at their Lawn ground. Ninety minutes and extra time later, the two sides were still locked at 1-1 so it went to a penalty shootout for the chance to host Swansea in Round Two. Eventually the league side won through, but only after an incredible 24 penalties had been taken, and FA Cup record. With both teams missing one kick each in the first stages and even the goalkeepers having taken and scored one, the tie was eventually decided when a Green player missed his second shootout kick, leaving Macc 11-10 winners. our photo is actually of an ex-Forest Green player, Jason Drysdale - whom you may recall was one of Kevin Keegan's less memorable signings for Newcastle. 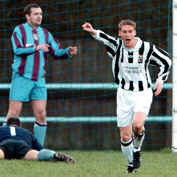 He was recently spotted playing for Aberystwyth Town, but has just now joined Bath City. They may no longer be the World's Favourite, but we here at NUFC.com are proud to salute the flag-waving achievements of the British Airways Newcastle football team. 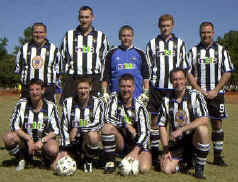 Pictured here in the sunny climes of Atlanta, GA, USA in late October, the lads took part in the 12-team Delta Airlines Soccer Competition and courtesy of the toon wore the famous black and white strips with pride (and no doubt suffered numerous queries from uninformed locals as to why they were dressed in referee's jerseys). Special thanks to Wing Commander Gary Annis for the photo. PS: True to toon form the lads lost their 3rd / 4th place playoff.........in a penalty shootout, but football was the winner. The Hall Corner club have had a mixed season, a rash of postponements leaving them idle over the holiday. Like a certain other team in black and white, they tumbled out their county cup to lower level opponents, in their case Ripley Town from three leagues below them.